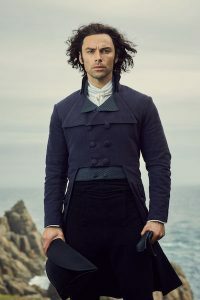 It’s 1796, and to defend Cornwall and those he loves from an empowered George, Ross must play the political game on a journey that takes him to the nation’s capital and into new perils. The Prime Minister calls an election and uncertainty grips the country. Ross watches Cornwall suffer under the power of Truro’s MP, George Warleggan, while Demelza remains caught between Ross and a lovesick Hugh. The Enyses contemplate having a child and Elizabeth seeks the same to secure her marriage. Morwenna uses Osborne’s affair with her sister Rowella to keep the reverend’s advances at bay. Sam and Drake are blamed for a murder, and Ross nds himself powerless to save his brothers-in-law. The Poldarks determine to get their relationship on track and the Enyses announce they’re expecting a child. Hugh’s health prevents him for standing in the election, so the candi- dacy is offered to Ross — but will he accept? Ross makes his maiden speech in Parliament and nds some notoriety in London, where he also re-unites with a now adolescent Geoffrey Charles. 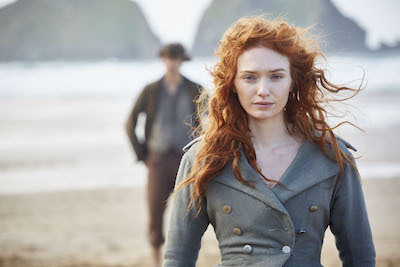 In Cornwall, Demelza contends with a failing mine and xing Drake’s broken heart. Dwight and Caroline welcome a baby daughter, Sarah, into the world but Dwight’s happiness is short lived as he makes a disturbing diagnosis. George hosts an extravagant party at Trenwith in the hope of buying his way back into Parliament and his new friend, the dangerous socialite Monk Adderley, makes the necessary introductions to set George on his way. To his frustration, Ross faces successive failures in Westminster and he is advised to take a slyer approach. Back in Cornwall, Demelza continues her matchmaking efforts. George nds the opportunity to ruin a business rival and the Poldarks in the process. Ross whisks Demelza off for a passionate getaway in London, and Elizabeth has news for George. 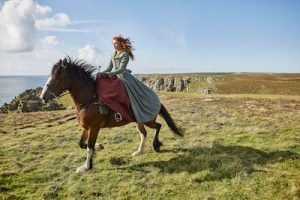 The Warleggans’ domestic bliss comes under threat and as Morwenna takes fate into her own hands, Ross and Demelza encounter deadly complications on their vacation. Elizabeth hopes to persuade George that Valentine is his child once and for all. Ross returns to Cornwall to mend things with Demelza. Dwight delivers the Warleggans a daughter, Ursula, and George relates news of his knighthood to Elizabeth. The Poldarks look to a new century of change together. Poldark, Season 4 is a Mammoth Screen production for the BBC and MASTERPIECE. Based on the novels by Winston Graham, it is written and created for television by Debbie Horsfield, produced by Michael Ray and directed by Joss Agnew and Brian Kelly. The executive producers are Debbie Horsfield, Karen Thrussell and Damien Timmer for Mammoth Screen, Elizabeth Kilgarriff for the BBC and Rebecca Eaton for MASTERPIECE. It is distributed internationally by ITV Studios Global Entertainment. been essential Sunday night viewing for millions of fans since 1971. Rebecca Eaton is the executive producer of the series. Funding for MASTERPIECE is provided by Viking and Farmers Insurance® with additional support from public television viewers and contributors to The MASTERPIECE Trust. Presented on PBS by WGBH Boston, MASTERPIECE is known for recent hits such as Sherlock, Downton Abbey and Victoria, and beloved classics such as Upstairs Downstairs, Prime Suspect, The Forsyte Saga and Poldark.